Not just for breakfast anymore, muffins are appropriate for every occasions and meal. Delicious photographs of the muffins accompany 120 recipes. 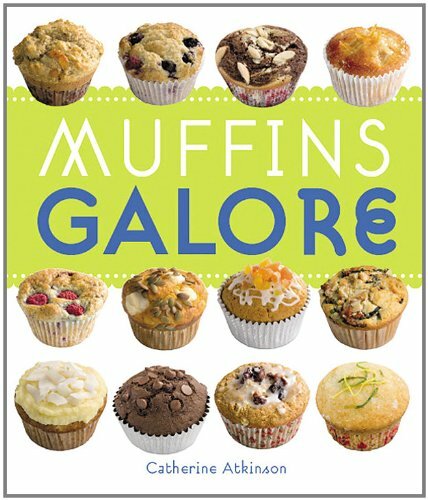 The chapters include: Fruit muffins, Chocolate Muffins, Nuts and Spices, Savory Muffins, and Healthy and Special Diet Muffins. This comprehensive collection of all-time classic muffin recipes contains loads of old favorites to bring back sweet memories of childhood, and a number of new recipes that will have the whole family pleading for more. You?ll find old staples like Mixed Berry Muffins, Double Chocolate Chip and Cinnamon Swirl Muffins to new interpretations of traditional recipes like Sweet Potato, Roasted Chili and Feta to Coffee Walnut and Fresh Raspberry and Lemon Muffins. Muffins Galore is your one-stop guide to baking these popular little treats.